Inexperienced sewers in particular often find it difficult to rethread the machine correctly when changing thread. The BERNINA 330 SE First Love’s built-in needle threader saves you time and effort, making thread changes easy and hassle-free and minimizing the risk of error. No complicated thread guiding, no looking-up in the user manual – the BERNINA 330 SE First Love pares down the threading process to the bare essentials and prevents problems before they occur, letting you get back to your sewing project faster and leaving you free to focus entirely on the creative side of things. 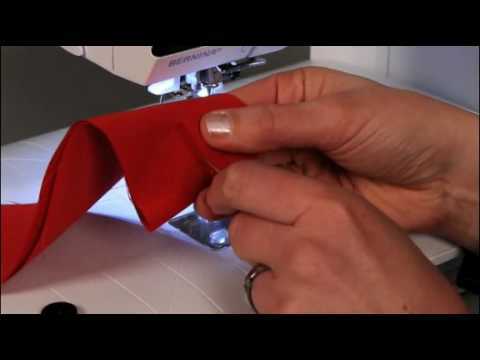 Buttonholes can be a challenge even for experienced sewers and quilters. With the BERNINA 330 SE First Love, you’ll sew perfect buttonholes of the exact same length right from the start – thanks to the automatic buttonhole function. Simply set the desired length and sew; the settings are automatically saved in the BERNINA 330 SE First Love’s memory and are immediately available again for the next buttonhole, however many you sew in a row. The automatic buttonhole function guarantees completely identical buttonholes for instant sewing success. The BERNINA 330 SE First Love provides even novices with an easy introduction to an advanced technique. The BERNINA 330 SE First Love’s bright LED sewing light lets you achieve precise results and affords you a clear view of your project at all times, even with poor ambient lighting. Particularly during longer sewing sessions, an LED sewing light represents an essential feature, enabling you to sew for long periods without eye fatigue. The BERNINA 330 SE First Love therefore also scores with an ergonomic advantage: – intricate sewing projects can be optimally controlled and the user’s eyes are spared thanks to the even, glare-free illumination of the work area. Here, the neutral light characteristic of the LED sewing light guarantees your ability to judge the color effect of the thread used even while you are sewing, entirely without distortions from external light sources with a color cast, such as neon tubes or lightbulbs. A small detail with a big impact! The BERNINA 330 SE First Love’s broad variety of stitches are an invitation to try out and experiment, letting you create attractive stitch combinations that you’ll want to use again the next time you turn on your machine. Whereas in the past you’d need a notebook to jot down your stitch combinations, the BERNINA 330 SE First Love offers a generous long-term memory with 30 free locations for your own stitch creations. This ensures that your favorite or most frequently used stitch combinations are immediately available again at the press of a button. The BERNINA 330 SE First Love offers an extra touch of luxury missing from many entry-level machines – room for your own creativity. The memory function is also a useful aid when the BERNINA 330 SE First Love is being used as a sewing machine for sewing classes, since it ensures that required stitch combinations are also available again in the next class, exactly as they were saved. This saves time and guarantees identical results.